Listen to "Learn to Speak Kimeru - (Spoken in Parts of Eastern Kenya)" on your iOS and Android device. 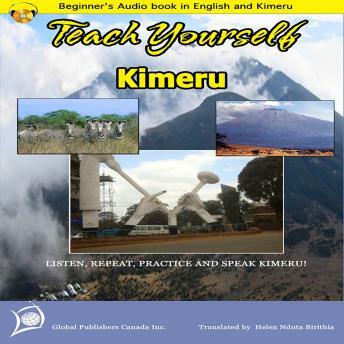 Learning Kimeru has now been made easy with this English-Kimeru audio book for beginners. The book was compiled by language experts and recorded by native speakers to simplify Kimeru learning. This book covers a wide range of vocabulary used in day to day communication with useful selection of expressions, words, sentence structures and phrases in Kimeru. It also covers some cultural aspects of the Kimeru language by giving some of its traditional popular proverbs, tongue twisters etc. This audio book could also be used hand in hand with its complete written version which is downloadable at www.amazon.com and other websites. Listen, repeat, practice and speak Kimeru!